I am forever on a quest to make the abstract more accessible, particularly in areas of faith where miracles lose their significance, their capacity to wow and woo, over time. But maybe that’s just me, which is all the more reason to spend my years fighting, praying for the discipline to understand and absorb what is holy but hidden from the loud, the extravagant, the rational. In giving birth you preserved your virginity, in falling asleep you did not forsake the world O Theotokos, we were singing as a family a couple of weeks ago in preparation for the Feast of the Dormition, when the Orthodox Church commemorates the bodily ascent of Mary into heaven at the end of a fruitful yet often excruciating life. I chanted the Troparian slowly, so my children could make out clearly the words, which, as usual, I believed in but had a difficult time making penetrate my present circumstances. Mary, Theotokos: there is so much I simply cannot comprehend about her multi-faceted identity as the Mother of God. After Columbine and Virginia Tech - in the aftermath of too many horrific occurrences involving senseless brutality and young people in our public schools, strict rules were set in place and uniformly followed through on. “I really don’t think that your son meant any harm,” purred Mrs. H, “but unfortunately, we didn’t have a choice. It is school policy that if any student makes a threat of any kind, that threat will be taken seriously and the student evaluated by a counselor. “Its just protocol,” was the underlying message I was receiving, as in, “Your fears about the darkening of your son’s reputation sound awfully paranoid for the situation at hand.” I was assured that the episode had been investigated and deemed innocuous. But Elijah, still raw with inexperience, was only beginning to come to terms with the shame and confusion accompanying those accusations, accusations of a type of violence he’d never previously been exposed to in either thought or word or deed. “If only you knew him like I did,” I’d briefly contemplated mentioning but just as quickly decided against it lest such a sentiment be interpreted as biased, overly meddlesome, or spitefully ignorant. “Can you believe he stayed with her?” they probably asked amongst themselves, maybe whispered in her presence. The moment she willingly accepted would mark the dawn of her public demise. From that day forth, her morality, convictions, and pious character would be called into question. She would have been isolated enough, both raising and being raised by God, without the added stigma of having her selflessness couched within nearly impossible to defy innuendos suggesting Mary was but a slave to her own base desires. “Let it be to me,” she said, ”according to your word,” and the bar was set for all of us who’d dare to swallow the Fire, the passions-searing inferno that is Christ. But what if she hadn’t, hadn’t promised him or appeased me? What if someday Elijah, or his siblings, or even Troy and I are pegged as a threat to peace and democracy - not for a foolish mistake, for crossing a line inadvertently, but rather for purposefully adhering to our Orthodox Christian beliefs at the expense of evolving American values keeping time with dangerous whims born of self-enlightenment. I worry for my kids; this world is changing rapidly, growing increasingly hostile towards Truth. There will come a day when opportunities are lost, freedoms restricted, reputations tainted by a refusal to compromise or espouse what was once viewed as sin but has now been gussied up and repackaged as open mindedness. It is highly possible that when such a day arrives, justice will elude our “bigoted” family. So, what then? “So, what now?’ she must have wondered in misery. The Orthodox Church honors and venerates the Virgin Mary as "more honourable than the Cherubim and more glorious without compare than the Seraphim.........." Her name is mentioned in every service, and her intercession before the throne of God is asked. She is given the title of "Theotokos" (Greek for "Birth-giver-of-God), as well as "Mother of God". She has a definite role in Orthodox Christianity, and can in no way be considered an instrument which, once used, was laid aside and forgotten. … The Virgin Mary in the Orthodox view is not regarded as a mediatrix or co-redemptress. She is an intercessor for us, and the content of prayer addressed to her is a request for her intercession. The Orthodox concept of the Church is the basic reason for the invocation of the Theotokos and all the saints. The Militant Church on earth and the Victorious Church in heaven are intimately bound together in love. If it is proper for one sinner to ask another sinner to pray for him, how much more fitting it must be to ask the saints already glorified and near the throne of God to pray for us. Surely, they know something of what goes on here, for else how could there be rejoicing in heaven over the conversion of one sinner? (Luke 15:10) The saints in heaven are equals of the angels (Luke 20:36), who are used by God in the accomplishment of His purpose (Acts 12:7). Rejoice! Rejoice! O pure Virgin! Thy son is risen from His three days in the tomb! Shine! Shine! Shine, O new Jerusalem! The glory of the Lord has shown on thee. Exult now, exult and be glad, O Zion. I am forever on a quest to replace fear with courage, doubt with assuredness, my own agendas, for both myself and for my children, with the exact same pliability and submissiveness the Virgin Mary displayed when stepping up to embrace a role that would open for everyone one of us the door to redemption, eternal life, and freedom from the hell of our own transgressions. I am determined, but awfully impressionable, dependent upon a community of believers both in heaven and on earth to stay the course. As a woman, I am thankful for my newly acquired intimacy with femininity in its purest form, with an example of sacred nobility that in every possible way outshines the dullness inherent in vanity, insecurity, and self-gratification - with the righteous, victorious, and most honorable Mother of Christ Jesus. 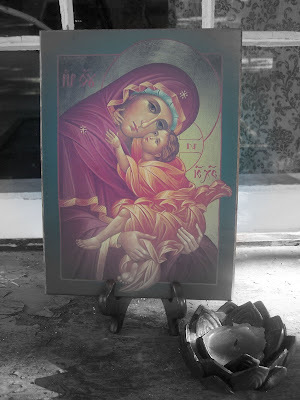 O Holy Theotokos, pray to God for us! Well, it is time for my quarterly Handmaiden plug as the Summer 2008 issue, focusing on Miracles and Pilgrimages, is due to arrive in the mailboxes of subscribers any day now. Again, I want to encourage you to find out more about this phenonminal publication containing faith inducing, soul strengthening articles designed to address concerns specific to Orthodox Christian women, if you have not already done so. Below you will find my own latest Handmaiden contribution enititled "Photo Opportunity," which can also be heard as a podcast on Ancient Faith Radio beginning sometime on 8/19. 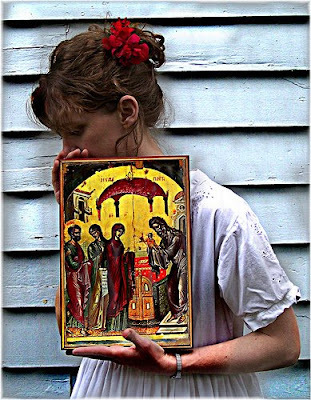 It began with an invitation from a cyber friend of mine to join an online photo-sharing group called “People with Icons,” which was inspired by a lovely set of photographs entitled, “Women with Icons,” created by the photographer Jocelyn Mathews. The idea being we would all take a picture of ourselves with an icon of our patron saint and upload it for others to look at. After viewing some touching contributions from my fellow group members, I was inspired to submit something of my own and so I walked upstairs to our prayer corner to find our image of the holy prophetess Anna. Upon approaching the far wall, however, adorned liberally with heavenly reminders of what truly represents the “one thing needful,” I looked her square in the eyes and then not without shame, retreated. I wasn’t yet ready, I discovered, for such a project. When we were joining the Orthodox Church, my husband and I were told to choose a saint, a patron saint whose name we would take as our own, whose identity we would try our best to emulate. We felt drawn to Saint Simeon and the Prophetess Anna; I liked that they’d met the Christ child simultaneously and it was special to me to have an icon featuring both of them together. These patron saints would pray for us, a concept that was new to me yet intriguing. I was at a loss, however, as to how to form a more intimate relationship with mine in particular. 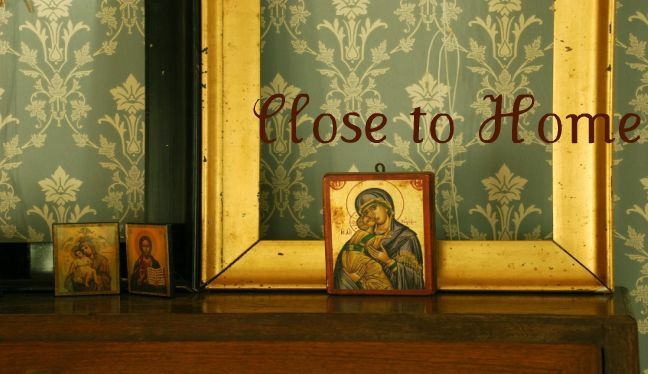 For the past ten years, I had heard St. Anna’s name when I went forward to receive the Eucharist; I closed my nightly prayers with, “through the intercessions of the prophetess Anna” …and all the other patron saints connected with our various family members. I revered her - I believed wholeheartedly in her dedication to all of us on earth trying to work out our salvation with fear and trembling, but at that moment, standing face to face alone in our second story hallway, the idea of posing with her for a photograph such as I would take with my best of friends, my mother or my Aunt, seemed inappropriate. I was long overdue in putting forth a concerted effort to better understand this most pious individual and through that acquired awareness, become more Christ-like. Thus began my mission to both uncover information and then meditate on its relevance to my life. I began to seek a way that I might soften the formality a bit and close the gap between us I had created through a lack of communication. Who are you, Anna? Which of your traits can I imitate and draw strength from? It would be well worth my time to find out. And there was one Anna, a prophetess, the daughter of Phanuel of the tribe of Asher. She was of a great age, and had lived with a husband for seven years from her virginity; and this woman was a widow of about eighty-four years, who did not depart from the temple, but served God with fastings and prayers night and day. And coming in at that instant she gave thanks to the Lord, and spoke of Him to all those who looked for redemption in Jerusalem. (Luke 2:36-38). When I explain to you what struck me immediately upon combing that passage like a detective searching for clues, you will accurately assess that I am, unfortunately, somewhat pessimistic and in need of a faith infused backbone. At a relatively young age, Saint Anna lost her first and only husband to death. This is beyond significant to me as I waste a lot of energy being afraid of that very scenario, at times to the point of emotional paralysis. “What would I do?” “How would I go on?” I wonder, blinking back tears during a bout of insomnia while watching the chest of my own beloved spouse rise and fall steadily with sleep. Anna was once a wife, as I am a wife. It is probable she loved with the same intensity that I do, the partner whose identity had fused together with her own and whose unexpected absence ripped a throbbing and open wound within her heart. Anna grieved, I am sure, she was most likely nervous about the future but notice that the sorrow was not, by any means, the end of her story. It is hard for me to imagine, with all the breeziness and comfort I’ve grown accustomed to, being married to the Church, spending every waking moment suppressing the urge to forget that I am called upon to be perfect, just as God Himself is. Anna prayed, we are told, and fasted with fervor unknown to me. Her unrestrained commitment is like a mirror revealing the chasm between what I currently am and what I could be. But rather than taunting our weaknesses the Prophetess Anna provides a respite from mediocrity, beaming like a lighthouse that leads away from the dangers of blindness and into safety. My neighbor is depressed about finances, her moody children, and she and her husband’s strained marriage. And what do I have to offer her? A lot more than I actually give, which is usually a nodding head and a sympathetic expression. It’s always sitting there on the tip of my tongue, the conversation about love--Christ’s love specifically--and how it transforms even the grimmest of situations. But what would she think of me if I unleashed that un-neutral bombshell? I suppose it shouldn’t concern me, and in all actuality should probably spill from my lips because my spirit cannot contain it - my gratitude and joy at having found the sacred pearl of great price (Matthew 13:45, 46). How can unashamed convictions and impartiality walk hand-in-hand? Why am I so timid about openly speaking the Truth? The Prophetess Anna, my holy namesake, was defined by her enthusiasm, her message about God and the imperativeness of repentance that never wavered, never fluctuated, never watered itself down to appease the masses. In the Temple thou didst embrace as an infant God the Word Who became flesh,/ O glorious Elder Symeon, who didst hold God in thine arms./ And also as a Prophetess the august Anna ascribed praise to Him./ We acclaim you as divine servants of Christ. I should know this, I should recite it on a regular basis; I should anticipate our Name’s Day instead of scratching my head two days after its passing asking, “H-m-m, now when was that again?” I should maintain an ongoing conversation, sharing my thoughts and insecurities along the way. I should remember that she is watching and witnessing my progression from a spineless observer to what I pray will be a bold and obvious beacon for Christ’s glory. I should remember her utter joy at having met her God incarnate and be stimulated to likewise rejoice. Pray unto God for me, O Holy Saint Anna, well-pleasing to God: for I turn unto thee, who art the speedy helper and intercessor for my soul (antiochian .org). I’ll have my mother come over to give me a hand, to hold the camera while I position myself in such a way that will visually, artistically represent my forging of a connection with a reality that binds heaven to earth, sinners to saintliness, me to an ancestor who has completed her race and now stands at the finish line compelling me to press onward. I will feel within my grasp the painted wood, a very touchable representation of that which blows my mind if I think about it too logically, instead of mystically or innocently like a child. I will use this opportunity, this invitation as a springboard to dive ever more deeply into the mysteries of the Church, into Her bosom of magnificence and righteousness. I’m a slow yet willing learner who admits to a habit of feet dragging but is now quite good and anxious to get started. Holy Prophetess Anna, I implore you to bring my burdens, all my baggage and my blunders before the exact same of Son of God that you held with such reverence in your aged arms. Please beseech of Him that my vision be enhanced, that the scales on my eyes be lifted, that I might see you, know you, venerate you, and be wiser, braver, more confident because of it. Forgive me for not asking this of you sooner. 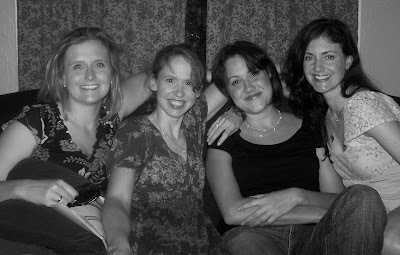 It is difficult to recreate the relationships made in those late teen/early twenties years, when there was plenty of time and opportunity to pour your energy into developing friendships. The bonds I formed in college were tight and sturdy. My friends and I lived together and affirmed one another no matter what the real truths may have been (“He totally still has feelings for you,” “That haircut is perfect for your face shape,” “Your professor is way too demanding!”). We were loyal and invested and aware of every minute detail in each others’ personal dramas. Sure, there were squabbles and painful periods of miscommunication but overall, the permanent impact our indelible connection had on each of us was overwhelmingly positive and fortifying. Eventually, I let go - or perhaps it would be more accurate to say that over time, my restlessness was forcibly pried from out of me by way of countless frustrating scenarios involving trantruming toddlers, long and lonely afternoons, an insurmountable amount of chores, and sibling rivalries, all wearing down skewed expectations. Eventually, I accepted my life for what it was and in doing so found purpose and meaning within it. All was quiet for a while; we drifted off, my friends and I, into unexplored new challenges we could only take on solo. But in the aftermath, when we finally resurfaced after months and years of diving deeper, and deeper still, under shallow preoccupations, we were able to reconnect on a whole new level. We met again, ready to share and encourage, within the context of our strengthened faith, layered and tested. We knew, of course, the answers lay outside of us and so we pointed one another in the direction of Christ Jesus. I, who once reserved all of my public references to God for Sunday mornings, found His name in my mouth during most of my conversations, on random weekdays, and in reference to everyone and everything because everyone and everything I now viewed in light of our salvation. Psalm 89 is a morning prayer designed to keep one focused on the Lord rather than on this temporal life and its hopelessness. For He exists outside of time, and is therefore our only refuge. Every morning is an opportunity to return to Him in repentance, and He is very patient, because a thousand years in His sight are like yesterday, which has passed, and like a watch in the night. He is very patient, because He does not will that anyone should perish. Therefore, when we focus on the Lord every morning, we look for His return at the Second Coming, and for His mercy, joy, enlightenment, and prosperity throughout each day. You are patient, You are patient, life is fleeting. Be my refuge, my compass, my brightness. Amen.